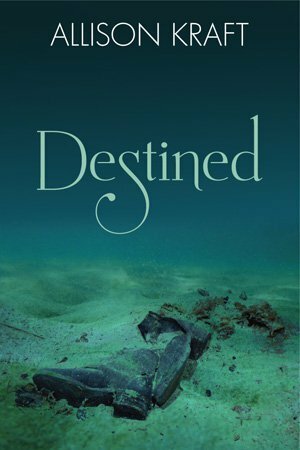 Literary Obsession is incredibly excited to host author Allison Kraft today to help promote her book, Destined! Synopsis (From Goodreads): While flying across the Atlantic on the centennial anniversary of the Titanic’s tragic maiden voyage, Apolline Greer, last in a long line of vampire hunters, finds herself suddenly transported from her airliner cabin to an eerily familiar ocean liner cabin—as well as the entirely unfamiliar body of her ancestor, Noelle Greer. Upon learning that she is, in fact, on board the very ship she’s been fascinated with all her life, she knows there’s only one thing to do: get off as soon as possible. Time, however, is not on Apolline’s side. The Titanic is on a collision course with destiny, and she only has four days to complete her quest. What seemed like more than enough time at the start quickly becomes too short as she finds that hunting vampires on a luxury ocean liner is much more difficult than she expected. Sasha and Cristof become more elusive as each day passes, while her feelings for Alexander become increasingly complicated. As that fateful night approaches, will she regret her decision to stay and witness history first-hand? What made you decide to have Apolline/Noelle allow the Titanic to continue on its fateful course despite knowing what will happen? I gave this a lot of thought when I was plotting out Destined. Initial instinct would be to have her try everything to save the ship and the people on board. If I somehow found myself in her place, it would be my first thought as well. But then I started to really think about it, about what things were like in 1912 and how her warnings would be taken. First off, she was a woman. A woman traveling alone in second class. If she started telling everyone she saw that the ship was going to hit an iceberg and sink, the best outcome would be that they would laugh off her warnings and forget them. The worst? She’d be locked up or given over to the ship’s doctor for being crazy. Second, as a frequent reader of time travel fiction, I lean towards the theory that certain events in our history have to happen. If someone tries to stop them, they will either fail, or events will rearrange themselves to make it happen another way. A kind of course-correction, if you will. In the case of the Titanic, while it was a horrible and tragic disaster, it brought things into light that desperately needed to be addressed. For one, people were forced to reconsider the outdated safety regulations about how many lifeboats a ship must have. For another, until Titanic’s sinking, ships were not required to have their wireless rooms manned 24 hours a day. If they were, the Californian’s wireless would not have been turned off, and they might have been able to get to Titanic in time to save everyone on board. And lastly, the disaster inspired the United States Coast Guard, in conjunction with 13 other countries, to organize the International Ice Patrol in an effort to avoid such a tragedy from happening again. Every year on April 15, they lay a wreath at the site of the Titanic’s sinking in honor of the lives lost. In Destined, I chose to have Apolline struggle with her decision, second-guessing herself nearly every time she came across an officer she might have warned. Intellectually, she knew there was nothing she could do, but in her heart, the more she got to know the other passengers, the more she wanted to save them all. She convinced herself the disaster needed to happen, that in some twisted way it was for the greater good, but was determined to do anything she could to save the lives of those she had grown close to. As the story progresses and she begins to fall for Alex, saving his life starts to become her focus. She is afraid if she tries to tell an officer about the ship’s fate, she will be deemed crazy and possibly even detained belowdecks, a sure death sentence not only for Alex, but for her own ancestor, Noelle. Getting them and their friends onto a lifeboat is a much more attainable goal than stopping the Titanic from hitting the iceberg. Whether or not she succeeds, well, you’ll have to read the book to find out! Well, like I said above, I’ll definitely be reading to find out! 🙂 Thank you, Ms. Kraft, for stopping by Literary Obsession and sharing some wonderful insight into your book, Destined. Thank you so much for hosting me today, especially when you have so much else going on. Best wishes to you and your family, and I hope everything is all right soon!